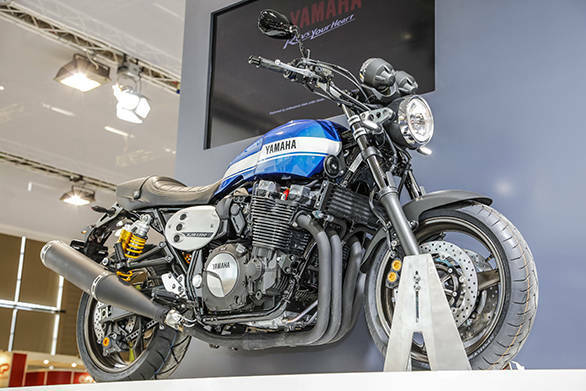 Yamaha has brought back its classic XJR 1300 as a 2015 model and it goes up squarely against Honda's retro CB1100. The XJR will come in two flavours, the standard model and a more sporty version called the Racer. Both bikes run a 4-valve, DOHC 1250cc motor, that is aircooled keeping with the retro theme. The engine produces 98PS and a very generous 108Nm of torque which peaks at 6000rpm. A five speed transmission sends the power to the rear wheel via a conventional chain drive. Braking is handled via twin 298mm discs up front and a single 276 rear disc. The XJR 1300 runs a 120 section 17 inch tyre up front and a 180 section 17-inch hoop at the rear. With the 14.5 litre tank fully fuelled the bike weighs in at 240kg. The XJR has been designed using inputs from famous design firms like Wrenchmonkees and Deus Ex Machina. The Racer model features a small fairing and low set clip-ons. It isn't a factory sold option but will be built by an official Yamaha dealer who claims to have used all Yamaha parts in creating the machine. Both bikes will be sold in three colours -blue, matt grey and black. The XJR 1300 will retail for Rs 8 lakh (before taxes and duties) while the Racer will cost roughly Rs 1 lakh more.